Back and forth, back and forth. Can anyone relate? Life mimics lifting, so like its sisterly move, the Seesaw Press, there is much going on with the Seesaw Row. So much to like. This is one of my very favorite lifts to include in circuits because, quite frankly, it means you don’t have to spend two stations rowing (lol), AND there’s something about this that makes you feel like a gd machine. It allows for more reach and more movement of the scapulae whereas it can be easy to get stuck back there. Allow for the to and fro, the give and take, the rotation around your spine, and be rewarded with a strong, healthy, mobile upper back. Here’s how to do it. You’ll position yourself at the outset of this row variation just as you would a double bent-over row. Suitcase deadlift or otherwise pick up two kettelbells (or two dumbbells, or two milk jugs, or whatev, tbh). Hinge forward from the hips approximately 45 degrees while staying wide across the chest, letting the weights hang down toward the floor. Make sure you’re sitting back strong in your hips, glutes, and hamstrings, rather than depending on the strength endurance of your lower back. This is your starting position. 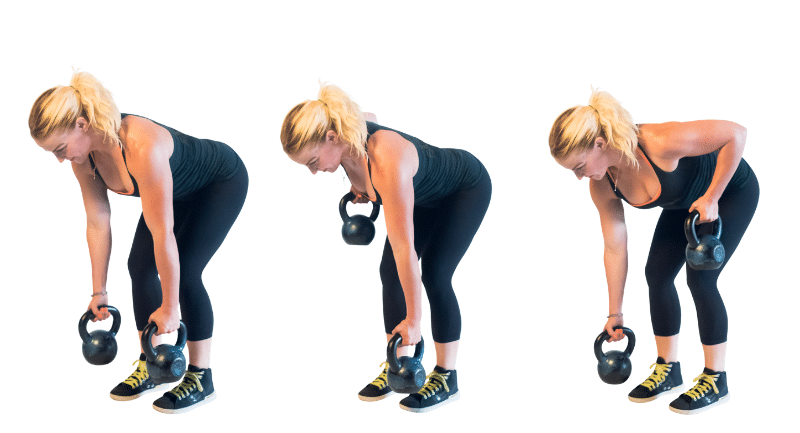 Keeping your elbow no more than 30 degrees out from your body and your shoulders down and away from your ears, pull one kettlebell up toward your rib cage using the muscles of your upper back. As you return that weight to the start position, simultaneously row the other upward so that they pass in midair.